Come and explore Yorkshire and the town of Harrogate with us this Easter. With daffodils blooming, lambs frolicking in the fields and the odd chocolate bunny, it’s the ideal place for a relaxing break. 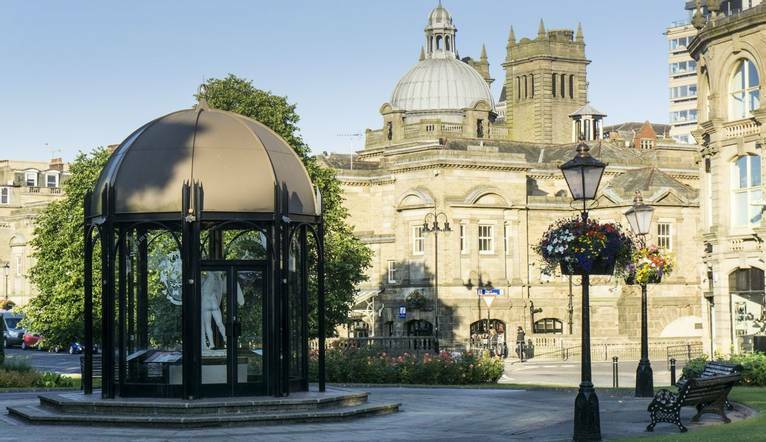 We will be based in the heart of Harrogate over this bank holiday weekend, a Victorian spa town resplendent with famous tearooms, Turkish baths, antique shops and plenty of historical charm. Our first evening includes a welcome drink, dinner and a fun social quiz, while on our second evening we can dance away to our DJ at the disco after dinner. After breakfast on Saturday morning we can explore the town of Harrogate with a guided tour. Look out for the Royal Pump Rooms, the stunning Valley Gardens and lovely Betty’s Tea Rooms. The afternoon is then free to explore and relax on our own or even buy the odd chocolate egg or two! On Sunday we will head further afield into Yorkshire where a full day tour awaits. Our guide will showcase some of the best spots and stories the county has to offer, starting at Ripley castle and the village with its colourful history; before departing for Pately Bridge, home to the oldest sweet shop in England and Grassington with its stunning views. We can also explore Skipton, the ancestral home of the Cliffords and Thomas Spencer, one half of M&S. We stop here for lunch (own cost) before heading on to Ilkley; where Alan Titchmarsh was born and Jimi Hendrix had his shortest concert in 1967 and then Lower Whafedale. We will then head back to the hotel via Ripon, where the blowing of the horn remains the oldest ceremony in the world. Located just a short walk from the town centre, this lovely Victorian hotel has history dating back nearly 200 years. It caused a stir when Agatha Christie retreated here after famously disappearing for 11 days! The hotel is located off Junction 45 off the A1 and then exit onto the A661 to Harrogate. Harrogate station is 1 mile away. Have dinner in the elegant Wedgwood Restaurant before relaxing in the Library lounge with a drink. Complimentary car parking is available at the hotel. Parking is regulated by the Council and you must display a valid permit which can be collected from reception on arrival. Our comfortable bedrooms feature Freeview TV and radio, tea/coffee-making facilities and hairdryer. The hotel is located off Junction 45 off the A1 and then exit onto the A661 to Harrogate. Harrogate station is 1 mile away. Complimentary car parking is available at the hotel. Parking is regulated by the Council and you must display a valid permit which can be collected from reception on arrival. Guided Walking Tour of Harrogate on Saturday and a full day guided coach tour of Yorkshire on Easter Sunday. There is often confusion on the question of gratuities, since it frequently depends on the type of holiday, location and, of course, your attitude towards tipping, as to what is normally expected. In order to give you a rough idea, we have given appropriate guidance below. The Tour Leader will be on hand to offer advice or suggestions if required but gratuities are offered entirely at the sole discretion of the individual.We suggest a group collection at the beginning of your holiday to cover drivers, guides and hotel staff (including restaurant, kitchen and reception staff) of approximately £7. Your Tour Leader will collect this on your behalf and distribute it accordingly, thus relieving you of the burden of who, when and how much to tip. The tipping of bar staff and housekeeping will be left to your individual discretion (the rounding up of the drinks bill and a small amount left in your room on departure should cover this and would be much appreciated). As is customary, ‘the hat’ will be passed around for the driver and guide on all optional excursions. For any meals that are not included in your itinerary, restaurants expect a 10% gratuity (do check that service has not already been added to your bill). For taxis 10% off the metered fare.